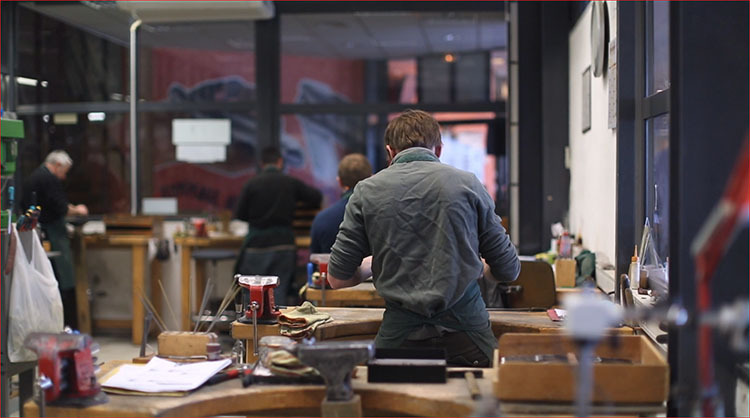 Our family business counts more than a dozen knifemakers. It takes up to 109 different steps to fashion a Laguiole with a single blade and 216 steps for a Laguiole with 3 parts (blade, corkscrew and awl). Here is the sequence of operations that a knifemaker’s hands perform with the raw materials. It is precisely because of this lengthy process that our traditional craftsmanship can guarantee that every Laguiole is unique object. We maintain the traditional skills from the very first Laguioles: just one individual knifemaker is responsible for adjusting, fashioning, polishing and sharpening each Laguiole themself. They constantly check their own work throughout all the different steps. 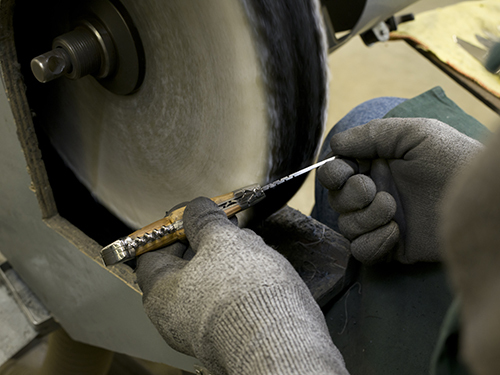 The workshop foreman conducts a final check and, if necessary, instructs the knifemaker to correct any faults. The final step is for the staff to wipe the Laguiole knife, label them, etc. The knifemaker starts, on his workbench and then on the grinding belt, by preparing the component parts for the Laguiole: spring, blade, liners, etc. Then he makes the necessary adjustments to fit the parts and finally he fits the handle material (wood, horn, etc.) with the bolsters. The knifemaker assembles the parts for the handle (spring and liners). He screws (or rivets) the handle material on the metal skeleton of the handle. Making the shepherd’s cross on one side of the handle. The knifemaker assembles the blade with the handle. Then he adjusts the action for opening and closing the blade. 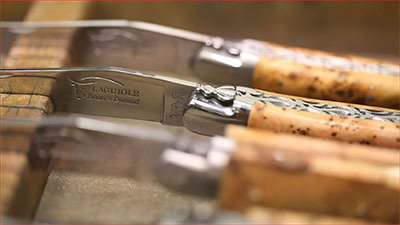 Laguiole knives are assembled from the raw materials. 5 - Mechanical adjustments to blade and handle completed Next step: delustering. The work involved in fashioning the handle is a sequence of operations on grinding belts with increasingly finer grains (rough grinding, initial finishing, final finishing). The material for the handle and the metal parts are fashioned together. 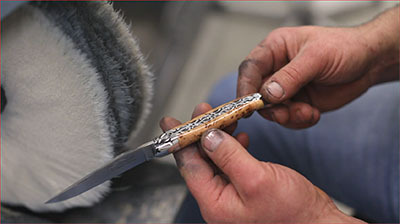 The knifemaker goes on to polish the knife, which is carried out in several steps: polishing with cotton cloths impregnated with grinding paste. Sharpening the blade is the last step. 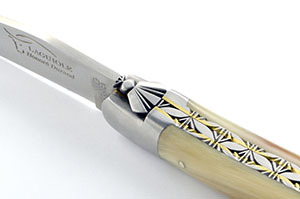 Try working as a knifemaker for a day and take home a Laguiole that you’ve made yourself!